Vetiver oil is an essential oil that is extracted through steam distillation of vetiver roots. The vetiver plant is found in India, Haiti, and Indonesia. It has a soothing and stabilizing scent, which increases its utilization in fragrances, and is further used as a major constituent in approximately one-fifth of all fragrances. The oil’s soothing and calming aroma has led to its increased adoption as a complementary treatment for anxiety, depression, and other mental health disorders, including ADHD and PTSD. Among applications, the pharmaceutical segment is expected to be the fastest growing segment in the market, owing to its sedative, nervine, and antiseptic properties. Moreover, vetiver oil can be used as a pest repellant in conjunction with other essential oils. Low quality and quantity of raw materials used for the production of vetiver oil is the major factor restraining growth of the vetiver oil market. Harvesting the crop at inappropriate times reduces the quality and value of the vetiver roots. Rampant premature harvesting of roots practiced by farmers in Haiti is mainly due to poor financial conditions of farmers in the region. North America and Europe accounted for a major share in the global vetiver oil market, in terms of revenue, in 2016. 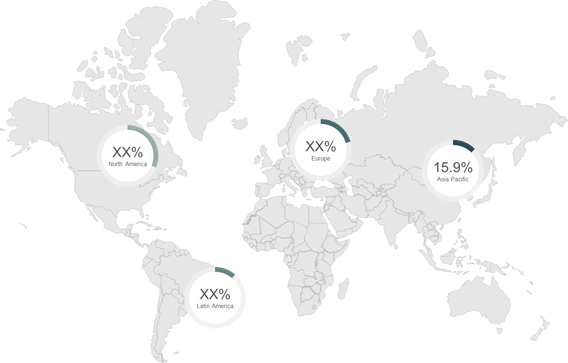 North America held a share of 30.9%, in terms of revenue, followed by Europe (37.2 %). The dominance can be attributed to a highly developed and mature market for fragrances in these regions. Asia Pacific was valued at US$ 9.0 million in 2016 and is expected to exhibit a CAGR of 16.45%, to reach US$ 34.17 million by 2025. Growing demand for vetiver oil in Asia Pacific due to rising consumer awareness coupled with growing demand for fragrances has augmented the market growth. Moreover, increased utilization of vetiver oil as flavoring in pan masala and chewing tobacco has fueled the market growth. According to World Health Organization (WHO), in 2016, South Asia accounted for around 80% of the world’s chewable tobacco users. Latin America is also projected to be an attractive target region for sales of vetiver oil. This is attributed to a highly developed market for fragrances. According to ABIHPEC (Associação Brasileira da Indústria de Higiene Pessoal, Perfumaria e Cosméticos), Brazil was the world’s largest market for sales of fragrances in 2016. However, the slowdown of Brazil’s economy affected sales of fragrances. The Brazilian economy shrank by 3.6% and 3.8% in 2016 and 2015 respectively. According to the International Monetary Fund, the Brazil economy is expected to bounce back and grow by 1% in 2017. Europe was valued at US$ 20.89 million in 2016. Increasing demand from the pharmaceuticals industry for treatment of mental health disorders has fueled the market growth. According to WHO, in 2014, around 83 million people were affected by mental health disorders in Europe. Moreover, high sales of fragrances in Western European countries has fueled the vetiver oil market growth. The global vetiver oil market was valued at US$ 56.34 million in 2016 and is expected to exhibit a CAGR of 13.71%, in terms of revenue, during 2017 – 2025. North America and Europe accounted for major shares in the global vetiver oil market, in terms of revenue, in 2016 and this trend is projected to sustain over the forecast period. The regions held a combined market share of 68.1% in 2016. In Asia Pacific, the lack of awareness among populace in rural areas of emerging economies and premium pricing are major factors restraining the vetiver oil market growth. Vetiver oil is a type of essential oil, which has soothing and healing properties. The oil is utilized in applications such as fragrances, flavoring in food & beverages, and pharmaceuticals among others. The oil is produced by distillation of vetiver roots, majorly in countries such as Haiti, Indonesia, India, Reunion (France), and Brazil. The medicinal properties of the oil are well documented and it is widely used as a traditional medicine for the treatment of boils, burns, insect bites, and stings. Increasing demand for vetiver oil in fragrances and pharmaceuticals applications has fueled the market growth. Moreover, the oil reduces inflammation, anxiety, nervousness, and is also used in medicines to eliminate scars and heal wounds. North America and Europe are lucrative regions for the vetiver oil, owing to increasing demand of oil in natural fragrances. Europe held the largest market share in the global vetiver oil during 2016, with US$ 20.9 million and projected to witness a CAGR of 13.34% over the forecast period (2017-2025). Germany, U.K., France, and Italy offer significant opportunities for growth of vetiver oil market in Western Europe. Asia Pacific is accounted to be the fastest growing region in the global vetiver oil market, owing to the increasing population and growing awareness regarding the health benefits of vetiver oil. Asia Pacific is estimated to exhibit a CAGR of 16.45% during the forecast period, to reach US$ 34.2 million by 2025. Key companies covered as a part of this study include International Fragrance and Flavor Inc., Lluch Essence SL, UniKode S.A., Frager S.A., Robertet Group, Ernesto Ventos S.A., Floracopeia Inc., Fleurchem Inc., and Haiti Essential Oil Co. S.A.
Haiti Essential Oil Co. S.A.
International Fragrance and Flavor Inc.
* Browse 100 market data tables* and 60 figures* on "Global Vetiver Oil Market” - Global forecast to 2025.